BACKGROUND: Medical litigation, especially against orthopaedic surgeons, is a worldwide phenomenon with a marked upward trend in the developed nations. There has been a 20% increase over the last five years in South Africa alone. The purpose of the study was to review the cases involving Medical Protection Society (MPS). members in RSA, identify trends and review the literature to see what can be done to prevent litigation. METHODS: A retrospective review was conducted (1 January 2000 to 31 December 2009) of all anonymised orthopaedic cases reported to the MPS. The total number of cases reviewed was 1 186. Furthermore, a review of the literature was conducted to identify possible strategies to reduce litigation cases. RESULTS: The results revealed that spinal surgery was the group most commonly litigated against, accounting for 11.6% of all cases. 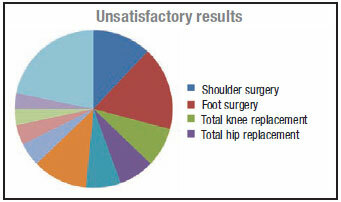 Second most common were the cases in which the patient deemed to have had an unsatisfactory result (10.5%). 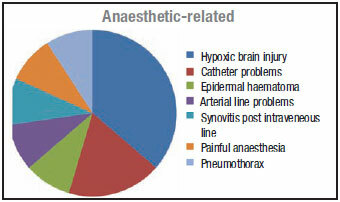 Following these were cases of: communication problems (6.9%), billing problems (6.6%), missed diagnosis (5%), gross negligence/unavailability (4.7%), medical report problems (3.9%), wrong site surgery (3.5%), failed surgery (3.4%), nerve injury (3.4%), death (2.7%), infection (1.9%), arthroscopy (1.8%), retained instruments (1.6%), POP complications (1.5%), diathermy and other burns (1.3%), consent (1%), vascular (0.9%) and compartment syndrome (0.67%). 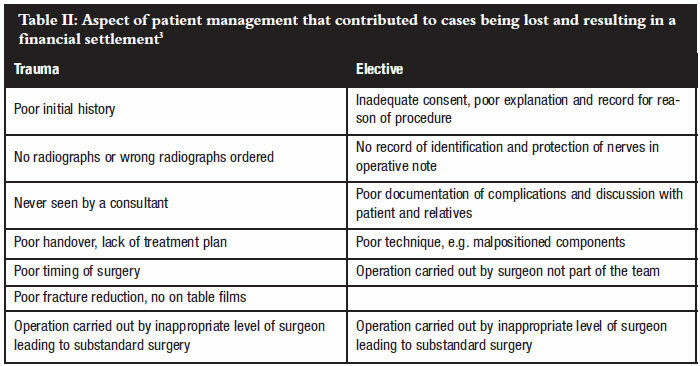 The current international literature reveals that most of the cases leading to litigation are caused by poor communication between the surgeon and patient. This can be prevented by attending a communication skills workshop (as presented by the MPS). Wrong site surgery still occurs worldwide and is indefensible in a court of law but is easily prevented by following the universal protocol for preventing wrong site, wrong procedure and wrong person surgery (explained later in the article). Consent remains vital before any surgical case and a record of the discussion pertaining to the consent should be documented in your clinical notes. Missed vascular injury has a high morbidity and by having a high index of suspicion and using the ankle brachial pulse index the incidence can be brought down. Product liability cases are surfacing as the law changes and orthopaedic surgeons start to help designing products. Litigation is a global problem with a marked upward trend in the last five years. In the USA in 2006, there were 12 513 malpractice claims.1 These claims resulted in nearly $4 billion being paid to plaintiffs and this represented 13 per 1 000 active, non-federal physicians. In the UK in 2007, the NHS litigation authority received 5 470 claims related to medical negligence and paid out £633.3 million2 (up from £422 million paid in 20063). In South Africa, there has been a 20% increase in the number of cases involving orthopaedic surgeons belonging to the Medical Protection Society (MPS) in the last five years. In Gidwani's3 review of NHS cases, the two most common reasons for litigation were substandard surgery and a delay in diagnosis or treatment. 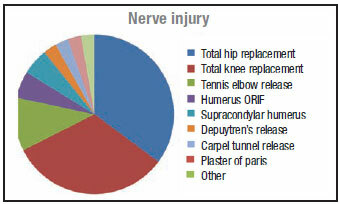 A retrospective analysis was performed of the MPS data from 1 January 2000 to 31 December 2009 involving orthopaedic cases. 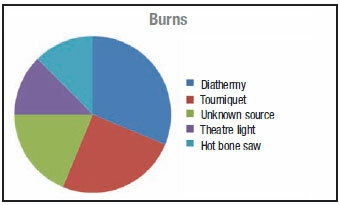 Top level anonymised data was provided by the MPS and analysed by the authors. The information was provided by the MPS on the understanding that it has not been subject to any rigorous scientific analysis or clinical coding, and cannot be described as quantitatively robust; it does however shed some light on trends and patterns. The cases included complaints, potential claims and claims. The information was wholly anonymised and contained no financial information such as estimate, compensation or costs. The data also did not include surgeon name or practice and patient details were only known to MPS and not to the authors, to which they assigned a case number. 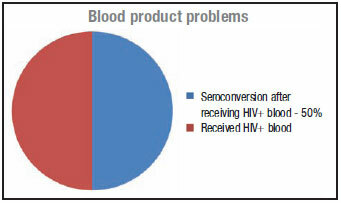 A total of 1 186 cases were reviewed, analysed and subdivided into common groups. A total of 1 186 cases were reviewed and analysed. Of these cases, 539 were instituted between 1 January 2000 to 31 December 2004 and 647 between 1 January 2005 to 31 December 2009. This represented a 20% increase over the last five years. 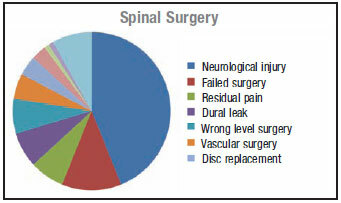 The most common cause for litigation was neurological damage that occurred during spinal surgery (4.9% of all litigation reviewed in this series). Medical errors occur. When they do, they have lasting consequences for both the patient and the physician. 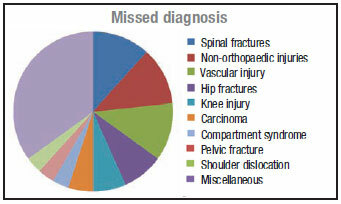 Orthopaedic surgeons are particularly vulnerable because their work can be visualised on radiographs. Our primary goal is to provide excellent care for our patients and to do all that is possible to prevent complications. If a medical error does occur, how should we react and what should we do? Communication should be the centre point around which the orthopaedic surgeon-patient relationship is built. 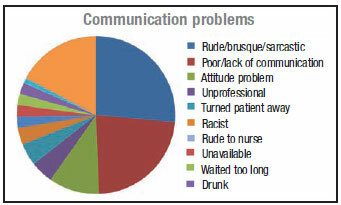 Breakdown in communication has been cited as one of the most common causes for litigation, accounting for 24.3% in the series by Wong et al.4 Gutheil et al theorised that patients look to their surgeon for reassurance in the face of uncertainty in much the same way a child looks to the parent.5 Gutheil suggests that surgeons often accept this infantile interpretation that they are the all-knowing healer. This creates a paternalistic relationship where the patient feels reassured. If they then experience an unsatisfactory outcome they are likely to feel that something went wrong and that the surgeon made a mistake. The American Academy of Orthopaedic Surgeons (AAOS) has embarked on a communication skills mentoring programme in conjunction with the Institute for Health Care Communication. Recently, the MPS has also started presenting a communication skills programme and it is highly advisable for any orthopaedic registrar or consultant to attend it. The programme is called Mastering your risk. Good communication skills will improve the patient-surgeon relationship and will help to prevent litigation in a large majority of cases (unsatisfactory results, billing issues, perceived negligence, medical reports, infection, broken instruments, consent issues, breach of confidence and failed reduction). 1. Informed consent is not a substitute for patient education. 2. The forms used should be understandable and care should be taken to ensure that comprehension is achieved. 3. The surgeon should avoid the paternalistic approach when dealing with uncertainty in the patient. 4. A well-educated patient does not need to be presented with an exhaustive list of every conceivable complication but rather the patient should be an active participant in the dialogue about inherent risks of the surgery that are important to the individual decision-making process. 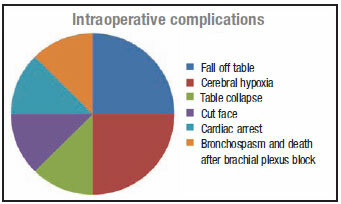 Wrong site surgery is a rare but entirely avoidable complication. 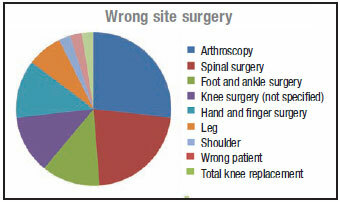 An orthopaedic surgeon has a 25% chance over a 35-year career of wrong site surgery.2,4,10 The most common sites of wrong site surgery are hand, foot and ankle surgery, spinal and arthroscopic surgery.2 The incidence of wrong site surgery in the NHS appears to be rising annually. An AAOS bulletin report states that 'a successful legal defence to surgery performed on the incorrect limb is almost impossible'.11 By taking simple measures it is possible to reduce the incidence. 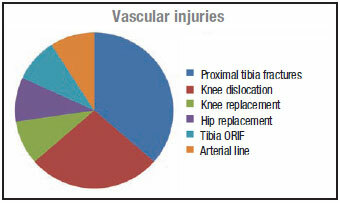 Missed vascular injury has severe morbidity and mortality for the patient and in the data reviewed the amputation rate for missed vascular injury was 90%, comparable with that of 86% reported in the literature.13 From the MPS data 72% of the missed vascular injuries occurred around the knee. Any patient presenting with an injury around the knee (distal femur fracture, knee dislocation and proximal tibia fracture) should be thoroughly assessed and a vascular injury actively excluded. Clinically, one should look for hard signs of vascular injury14 (absent pulse, expanding haematoma, active bleeding) or more subtle signs like a decreased pulse compared to the other side. Lynch and Johansen compared the use of ankle brachial pulse index (ABPI) to arteriography in 100 consecutive limbs.15 They reported a sensitivity of only 87% and a specificity of 97% when the ABPI was less than 0.9, with a vascular injury. This differs from Mills et al16 who reported a 100% sensitivity and specificity of vascular injury in patients with an ABPI of <0.9. Their population group consisted of only knee dislocations. Patients with an ABPI less than 0.9 should have an arteriogram (unless the exact location of the injury is obvious) and those with an ABPI greater than 0.9 followed up for 48 hours with 4-hourly ABPI16 performed by the same surgeon. The patient should be admitted to a unit with excellent nursing care (e.g. high care unit). A physician's conduct will be judged as negligent if it falls below the standard of care (e.g. 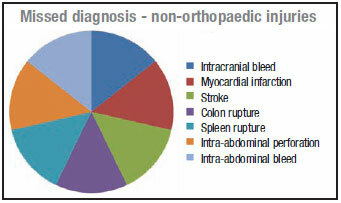 missed diagnosis).3 The principle of the Bolam test should be applied in each case of negligence. This states: A doctor is not negligent if he acts in accordance with a practice accepted at the time as proper by a reasonable body of medical opinion, even though other doctors may adopt a different practice. Gidwani et al reviewed 130 cases of alleged negligence against the NHS trust in the UK.3 They noted that there were certain facts that contributed to cases been won and lost, resulting in financial settlements. Prophylactic antibiotics should always be used.17 A firstgeneration cephalosporin such as cefazolin should be used 1-2 g (2 g for patient >86 kg). For patients with Beta lactam allergies, alternatives should be considered such as clindamycin. Vancomycin should be reserved for the treatment of lifethreatening infections. Vancomycin can be used in patients with suspected methicillin-resistant Staph. aureus (MRSA) colonisation (>5 days hospitalisation, previous ICU admission, patients from nursing homes). Antibiotics should be given 60 minutes prior to skin incision and before inflation of the tourniquet. If the surgery continues for longer than 3 hours, the antibiotic should be repeated. The duration of the antibiotics should not exceed 24 hours post-operatively. Many orthopaedic surgeons are involved in product development, either as a designer, consultant or clinical investigator. There is an entity called product liability9 which places these people at risk for litigation. Product liability is defined as any or all parties along the chain of manufacture for damage caused by that product or inherent defects in that product. 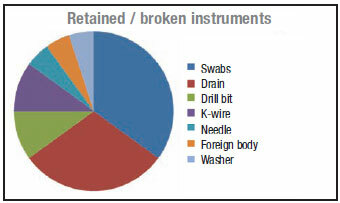 This can extend to the implant manufacturer, distributor or orthopaedic surgeon. The individual orthopaedic surgeons are liable if they are the designers of the product, consultants or clinical investigators. The Consumer Protection Act has recently been implemented. This Act makes all parties involved, from the manufacturer to supplier, jointly liable for the harm and loss resulting from defective goods. This means that the consumer can sue anybody in the supply chain and hold them liable for all the harm and cost. In other words, an orthopaedic surgeon uses a prosthesis, which, despite being the correct prosthesis and correctly inserted, fails prematurely. Prior to the Act, the patient could only sue the manufacturer. 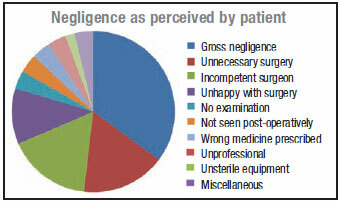 The patient would also have to prove that the failure was as a result of negligence. After the introduction of the Act, things became easier for the patient. All that has to be shown now is that the instrumentation failed prematurely and the patient suffered harm and loss from that failure. The patient can hold anybody in the supply chain liable. In the vast majority of cases, there is only one person in that supply chain that the patient can identify - the surgeon. We need to ensure that we use reputable suppliers who are insured for liability of their products and get them to give you indemnity on their products. Trauma is often perceived as the medical speciality with the highest risk of malpractice claims, but McGwin et al refutes this claim.1 In their series, looking at potential as well as settled claims, trauma had the fewest events and lawsuits per patient days. 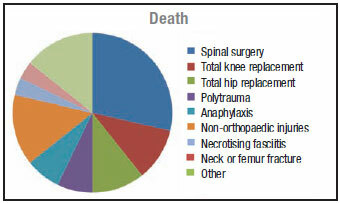 Does the ageing surgeon have an increased risk of litigation? Blasier22 suggests that there is weak evidence from clinical studies that links older surgeons with more complications and with being less adoptive of modern technology.22 Knowledge and experience remain for a long time. First to go is strength, then eyesight, dexterity and lastly cognition. Most surgeons reach the peak of overall performance around the second half of the fifth decade (45-50 years). In the subsequent decades, growing experience can, and does, more than compensate for diminishing skills. What should we do once an error has occurred? One way is to apologise.4,23 An apology is a statement that acknowledges an error and its consequences, takes responsibility and communicates regret for having caused harm23 - this can decrease blame, decrease anger, increase trust and improve relationships. The existing research suggests incorporating apologies as part of the disclosure of medical errors can benefit both the patient and caregivers.23 A thorough empirical examination of the role of apologies in addressing medical error and other adverse events has only just begun. Although the studies done suggest the potential for apologies to facilitate dispute resolution, there is still much that is not known. 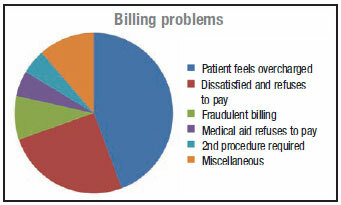 Segal et al propose a no-fault system supplemented by a variation of the traditional tort system whereby physicians are incentivised to follow evidence-based guidelines.28 How Segal's model works is that when consumers purchase a health insurance policy they would voluntarily transfer the right to sue (for negligence) to the payer.28 For this, his health insurance policy costs less. They receive the benefits of patient safety systems (e.g. electronic records).The consumer receives a life and disability insurance policy. Should there be any untoward outcome, the patient could access a predictable safety net in short order. Disability insurance would cover expenses related to time off work, and life insurance would provide resources if the wage earner dies. If the doctor follows cost-effective algorithms, the physician would be immune from litigation. If the doctor strays from the algorithm and a breach of care ensues, the doctor would be at risk for litigation. Litigation is a reality and there is an upward trend in developed countries, including South Africa. Communication is the centre point around which the doctor-patient relationship is built. By communicating openly and honestly with our patient and improving our communication skills by attending the Mastering your risk workshops, litigation can be reduced. We must ensure that good clinical notes are made in every case we see and operate. Informed consent should be signed before every surgical case performed and used as an opportunity to educate our patients. Be sure not to elevate your patients' expectations of the surgery. 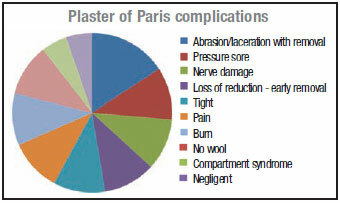 Wrong site surgery is entirely avoidable by following the universal protocol to prevent wrong site surgery. One should have a high index of suspicion for vascular injury with periarticular knee injuries and actively exclude it. Explain the risk and implications of infection with patients receiving an implant and use prophylactic antibiotics. As more surgeons are tasked with product development, we should be aware of product liability. With the introduction of the Consumer Protection Act we must make sure that we use reputable suppliers who are insured for liability of their products. Analysis, opinions and conclusions are solely those of the authors. The information provided by MPS was wholly anonymised and the information had limited scientific analysis.